NO! Wait - wait, wait! We covered this topic last year, right? Well, yeah, but we think it's time for an update - one that takes into account the changes in marketing strategies and approaches that eCommerce businesses will need to employ to effectively reach their target audience during the event of Black Friday and Cyber Monday. With that being said, did you know that sales during the Thanksgiving and Black Friday combined, were $7.9 billion in 2017? Not only that, but 40% of sales came from mobile devices. It's more than evident that the frenzy of the event is evolving to being both in-person and online. Do you want to learn how to make the most of this insanity? Well, we want to help you. 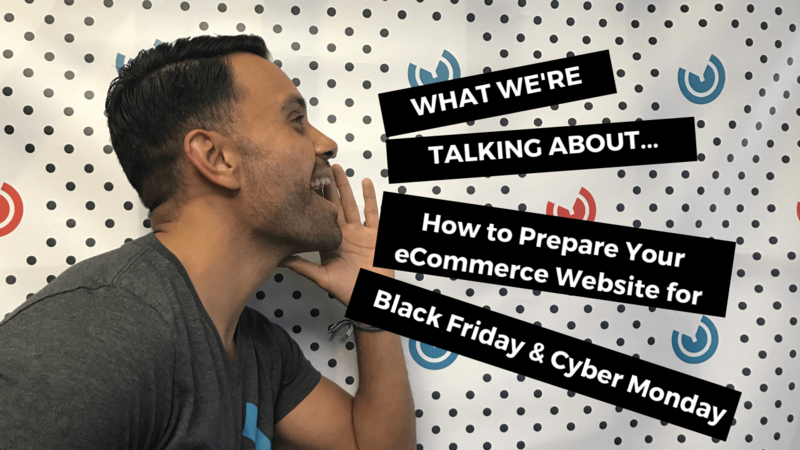 Read along and bulletproof your eCommerce site for Black Friday and Cyber Monday 2018 - PREPARE FOR THE INSANITY - oh, and here's what we're talking about. . . This article, rather Black Friday guide, by Kaleigh Moore from Business2Community covers well in-length Black Friday pro tips, why Black Friday as a consumer holiday really matters, different Black Friday statistics, how to get your site ready for Black Friday, Black Friday marketing ideas, the various channels for accessing Black Friday deals, and even the history of Black Friday's impact in certain countries. You name it, this guide has it. Email marketing makes up 25% of early Black Friday sales. What we learned from reading through the guide ourselves was: if you want to effectively market your eCommerce company during the Black Friday to Cyber Monday timeframe put a focus on optimizing your mobile website so that users can easily navigate it and not leave an abandoned shopping cart, be consistent when reaching out to customers, remind them about your seasonal deals, since you'll want as large a turnout as possible, and still provide a personal experience that entices customers, or else you may fall behind the many other businesses also taking advantage of these events. Mobile revenue was up 43% year-over-year between the timeframe of Black Friday and Cyber Monday. Comparing this article to last, it also reinforces the idea that eCommerce companies need to utilize and optimize their website's experience over the mobile platform. Take, for example, Shopify's merchants. They saw 64% of sales came from mobile rather than desktop during Black Friday and Cyber Monday. So, take note and follow suit. Spark Solutions offers a great preparation guide for Black Friday and Cyber Monday, covering 12 different strategies that you can utilize to properly ready yourself. We'll quickly cover them here, so to save you a bit of time, but don't let that take away from their original value. Prepare an eCommerce calendar, where you can promote exclusive offers before, during and after big events or dates. Review the previous year's analytics to draw conclusions from; how can similar offers better perform from last to this year? Test your website speed; peak traffic dates are approaching, so ensure that your website will run smoothly, and if not, you may lose a few customers. Empower user experience and performance fixes; maximize your ROI by making your website as simple and easy-to-use as possible. Improve your eCommerce SEO strategy; mobile is still an online platform, and if a customer is searching for a product, you should want your company to be one of the first results. Start promoting offers early; pay attention to how long your offers will stand - the average duration of offers last Black Friday and Cyber Monday was 10 days. Incorporate automated eCommerce marketing; create an automated workflow for abandoned cart recovery, newsletter, or product recommendations. Strengthen your automated outreach via fixes; and focus on recurrent issues, to limit the amount of customer inquiries due to frustration. Be transparent when it comes to extra costs; nobody likes to reach the end of their buying process and come across unexpected charges, such as shipping and handling, so instead, make it apparent nearer to the beginning of your target audience's buying process. Monitor metrics throughout all your different integrations and parts within your system; do this to catch any anomalies that may present themselves before, during or after the seasonal event, so that your website doesn't suffer downtime. Always have a developer ready to fix immediate issues; you won't want any failed transactions due to the lack of response by developers, and optimize website improvements during the evening, to minimize maintenance during the peak hours. Allow ease-of-access to customer service via multiple communication channels; make sure you or any of your business's customer service reps are easily accessible to solve for customer inquiries to minimize friction and enable more sales. How do brands followup if a customer leaves an abandoned cart - through email automation? 66% of retailers didn't respond to abandoned cart issues; meaning, they lost out on a tremendous amount of potential customers. 44% of brands didn't use email; meaning, they could have had better engagement with their audience had they promoted prior a Black Friday or Cyber Monday promotion. Those that did promote via email sent, on average, 18 emails around the day of Black Friday and Cyber Monday; meaning, certain brands recognize how important email is as a communication channel during the event. For even more statistics revolving around email marketing, head on over to their blog page! We've gone over a bunch of different statistics and findings as to why you should start preparing your eCommerce business for the upcoming Black Friday and Cyber Monday, if you haven't already. But we have still yet to speak about the how. Well, here is “the how-to” on preparing your mobile site for conversion rate optimization. You may recognize this interview from last year's Black Friday and Cyber Monday blog. Although, it doesn't explicitly share details on how to optimize your eCommerce business for the upcoming Black Friday and Cyber Monday, it is of similar value, talking about the topic of mobile CRO, its difference from traditional CRO, and the tools you should use for mobile CRO. We decided to include it here as well, because Chris Goward, “a pioneer in the world of landing page and conversion rate optimization” and founder of the full-service optimization company, WiderFunnel, gives just that great of advice. This time, however, we'll elaborate a bit more on the few main points of advice he gives, so you don't have to navigate the lengthy interview yourself. Approach the process of mobile CRO in two steps. First, have a strategy of understanding customer voice, different marketing touch points, and the value of your product or service. Second, do ongoing testing, primarily using A/B testing and qualitative research. Mobile websites can be simple rearrangements of desktop websites, however, if they are completely made-over, objectives of mobile CRO focus on the difference in context of mobile visitors, including: being more greatly distracted; less attentive; and having greater location-based needs. The behavior of mobile visitors isn't tied to industry, rather to other factors, for example, to a product or offer. Artisan & Optimizely, both apps that use standard A/B testing. Additionally, the tools that you do end up choosing for mobile CRO should also test and inform whether or not you need to minimize browser load times. How does this all relate to Black Friday and Cyber Monday? Well, you should ensure that not only your desktop eCommerce website is optimized for the oncoming onslaught of consumers, but also your mobile eCommerce website. This way, you hopefully won't lose many prospective customers to a faulty, hard-to-navigate, or even, irrelative-to-their-needs site. Did this article peak your interest? We sure hope it did! If you're still looking for ways to prepare yourself for 2018's Black Friday and Cyber Monday, look no further than our How to Create a Lead Nurturing Campaign Guide. It will set you on the right path to help you define the nurturing steps you should implement in your sales process, especially during this upcoming, quickly-moving seasonal event.